F ried pizza is as Neapolitan as buffalo mozzarella. It's been sold in Naples, Italy by restaurants like Fiorenzano and Pizzerie Starita, for decades and decades. The owner of Pizzeria Di Matteo once even claimed the fried version was more popular than the baked kind until the 1950s, and it still accounts for a third of the restaurant's sales. Gino Sorbillo, who has been described in the American press as the most famous pizza man in Naples, has made a signature of it. 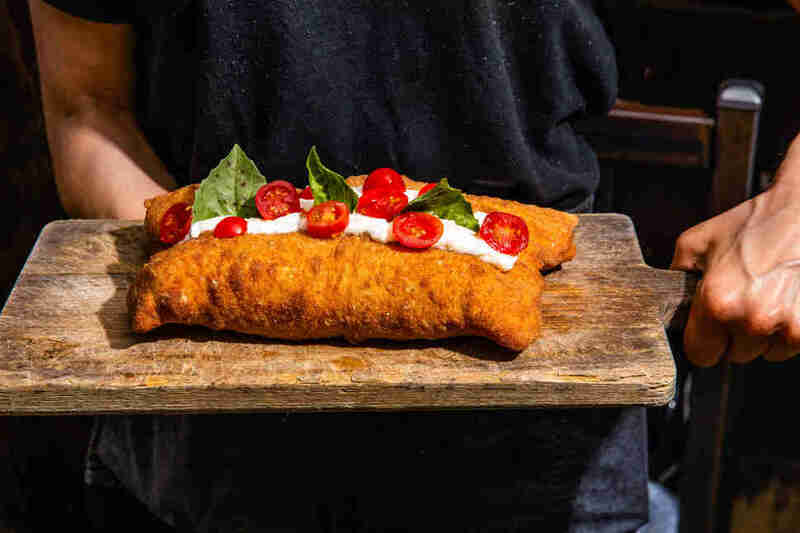 In fact, Sorbillo served fried pizza in New York (the second capital of the holy amalgamation of tomato sauce, cheese, and dough) before he did the classic baked pies. 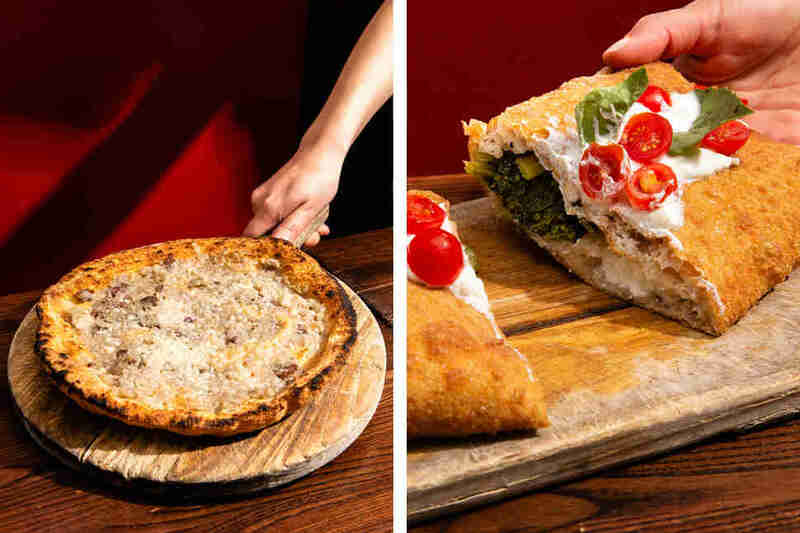 About a decade ago, New York pizza got back to its roots as a Neapolitan pizza wave washed over the city like a spilled jar of tomato sauce creeping over a cutting board. This brought with it Naples' puffy crusts, minimalist toppings, and... fried dough. Which Pizza Chain Has the Best Breadstick Options? The style that first made noise in New York was not the classic pizze fritte, however. It was the montanara, a higher achievement in the art of fried dough. The word means "coming from the mountain," an apparent reference to street food eaten by people from, well, the mountains. Montanara is distinct in that the dough is double-cooked and un-stuffed. It's first flash-fried, then the sauce and cheese are applied, and finally, it gets baked at a ripping hot temperature. The mozzarella melts, and the bread is not oily but does have the faint sweetness of fried dough. Still, the result is more delicate than brash: airy and even pillowy. The montanara seems to have first landed in the States in 2011 courtesy of an individual named Giulio Adriani, a Naples native who calls fried pizza "my reason for a green card." The double-cooking combined with the quickly baked toppings, he says, is what makes it so special. 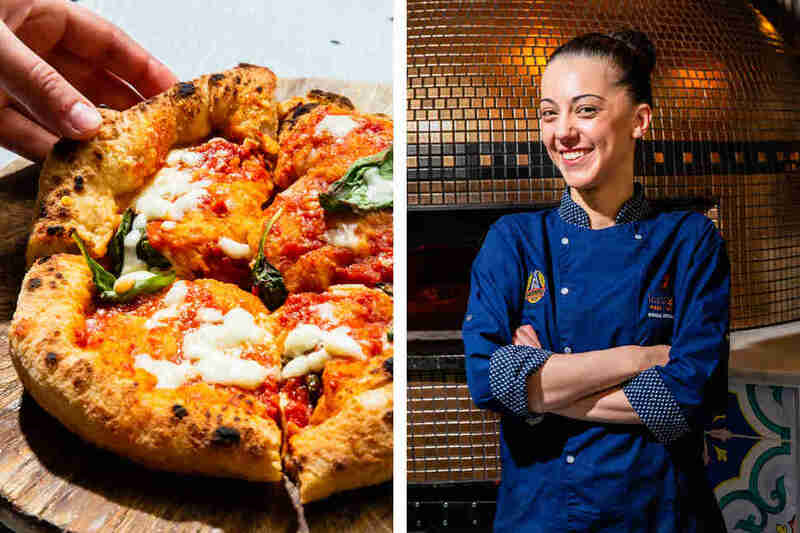 Adriani is also a globetrotting pizza man, the sort who wins industry competitions and is certified by the divisive Associazione Verace Pizza Napoletana. It was at Forcella, in 2011, that he first served the double-cooked montanara to New York. "You have to come up with the product at the right moment, when the customer is ready. I was pretty lucky that the day I had fun trying the montanara in New York, Adam Kuban of Slice was present," Adriani says. "He was the first to taste it in the United States, probably, at least done in that way of frying then baking." The pizza instantly became a curiosity in New York. Adriani opened a short-lived fried pizza only shop, La Montanara. PizzArte opened in Midtown. Kesté’s Robert Caporuscio and his daughter Giorgia partnered with Naples’ montanara maker Starita to open Don Antonio by Starita, where they offer the montanara and other pizze fritte. The openings were the subject of a 2012 column by New York Times critic Pete Wells, who saw the city taking to it because its obscure Italian origins were "both traditional and novel". The montanara has since fanned out from New York to other cities, pushed along by that novelty Wells spoke to: Denver in 2012, at Racca's (nee Marco’s); Dallas, where it’s an occasional special at Cane Rosso; Austin, at Quattro Gatti; Saint Paul, where it’s the only kind of pizza served at Mucci’s; Chicago, at Panino’s; and elsewhere. Americans, the ancient axiom goes, will eat anything if it's A) fried or B) a sandwich. Does that mean that fried pizza will inevitably be in every American home, available at the touch of an app and delivered by Domino's? Maybe, maybe not. Americans eat Neapolitan pizza because it's good but also because it's "authentic", and fried pizza, however old school, might not sound legit to them. Cane Rosso's former executive chef Dino Santonicola says he’s been surprised to have trouble pushing even the lightly fried montanara in Texas. It probably doesn’t help that the montanara also lacks the visual appeal of, say, Detroit-style pizza with its crispy cheese crust, because it is only lightly fried. "To be honest with you, the fried pizza didn't really take off. It's strange because they eat everything fried here, especially with the state fair we do once a year. You would hope it did better than it actually does," Santonicola says. He then echoes Adriani about timing. "When I first started serving Neapolitan pizza in America, in 2004 in Seattle, it was hard to sell. Today it's easier. Sometimes it's not the time, you're too early, or it's not the area." "Well, because of the success of the montanara in New York, it’s reflected also in Naples. More and more places have started to do it. Before I remember Starita, de Matteo -- those three, four, five places," Adriani says. "Now, it’s more commonly on most menus. There’s been an explosion also in Italy. Word of mouth arrived to Naples and people said, 'Oh, this can do well in Naples as well.'" Adriani is still betting big on the dough that got him his green card and (green) dough. 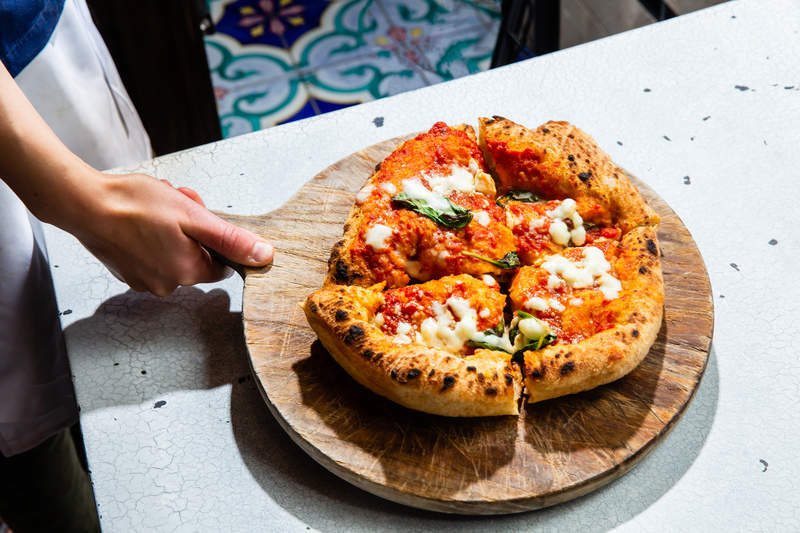 He’s migrated south to open the first Local Pizzaiolo in Atlanta and plans to open more not only in Atlanta but in Los Angeles and, eventually, New York. And of course, he's bringing the montanara with him. The only question is whether or not Americans want their pizza fried the Neapolitan way or if they'd prefer beer-battered --- or not at all.